The next generation Audi TT is expected to arrive late in 2014 as a 2015 model year vehicle with the Coupe coming first while the TT Roadster will arrive about a year later. Word on the street is that Audi wants for the third generation of the TT to call on the aspects of the first generation TT so very popular. While the initial Audi TT introduced for the 1998 model year was a true compact 2+2 sports car – available as both a coupe and a roadster – the second generation that debuted in 2006 was bigger in almost every way. The company added some aggressive exterior lines for the second generation (shown on the right) to toughen up the car a bit and while the model has remained popular, it has clearly deviated from the roots of the original. We would expect that the 3rd generation Audi TT that debuts in 2014 will have a smaller, more lightweight structure joined by exterior design that fits in with the current great looking Audi lineup. As is the case with the 2013 Audi TT, the next generation compact sports car will come in three trimlines; the basic TT, the mid range TT-S and the top of the line TT RS. The 2015 TT will be powered by the same turbocharged 2.0L 4-cylinder engine as the current model but with a new advanced injection setup, this entry engine will offer an increase of 9 horsepower for a total output of 220hp. The mid level 2015 Audi TT-S will also use a turbocharged 2.0L engine similar to the current version and this package benefits the most of the next gen models with an increase from 265 to 300 horsepower. The top of the line 2015 Audi TT RS will defy the earlier rumors that suggested that the inline 5 will leave the lineup – and the next generation TT RS turbocharged 5-cylinder engine will sport an increase of power to 380 horsepower from the 360 offered by the current models. These increases in power will likely make an even more substantial difference if Audi manages to cut some weight from the next generation TT. 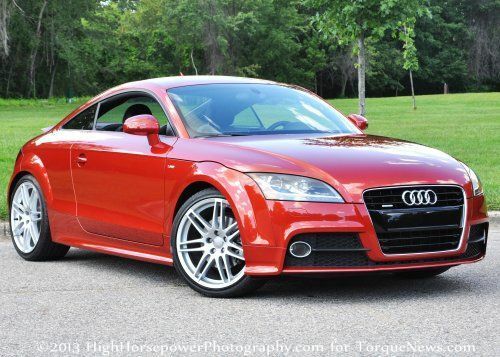 The 2015 Audi TT will continue on with front- and rear-wheel drive configurations. The transmission options are likely to remain the same with the TT and TT-s both coming with a standard Audi S Tronic dual clutch transmission while the new TT RS will feature a proper manual transmission. I wouldn’t be completely surprised to see a dual clutch option for the TT RS and with any luck, the good people at Audi will offer up a manual transmission option for the TT and TT-S. Finally, Car and Driver claims that the 2015 Audi TT will have an interior that is a simpler version of what is currently featured in the rest of the new Audi lineup with a high tech thin film transistor (TFT) gauge cluster that should afford the driver the option to configure the vehicle information display however he or she wants.